Cathedral Cove Walk: There are several scenic tracks on land adjacent to the reserve, including the 2 hour return walk to Cathedral Cove track, which gives access to Gemstone Bay, Mares Leg, and Cathedral Cove. Foot access to the Cathedral Cove car park is at the western end of Hahei Beach and vehicle access is up Grange Road (turn left past shops and go all the way to end of Grange Road). Thames Coast: A scenic drive along the Pohutukawa coast offers beaches and the Rapaura Water gardens at Tapu. There are also many bush walks in the area. Contact the Information Centre or Dept of Conservation to find out more. Totara Pa is a stronghold site for the Ngati Maru tribe who were defeated by Hongi Hika in 1821. The cemetery features the grave of Hotereni Taipari who opened Thames up for mining. Visit Hot Water beach and dig your own Jacuzzi. Cathedral Cove - accessible only on foot or by boat. 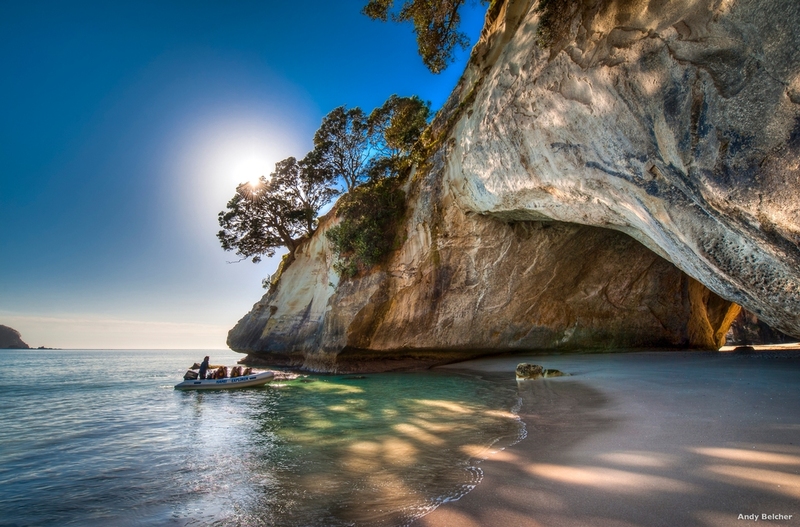 Famous Cathedral Cove is one of the “must visit” sites on the Coromandel Peninsula. Visit the many art and craft galleries the peninsula has to offer from fine art to wood carvings. Go for a ride on the Driving Creek Railway and soak in the stunning views along the way. Try the trapeze and other daring stunts at High Zone Adventure in Whitianga. Walk along the many scenic walking tracks and coastal walking trails the Coromandel has to offer. Take a coastal journey by mountain bike. Walk the fascinating old Paeroa to Waihi railway line around Karangahake Gorge. Mercury Bay Museum - located in the old Dairy Factory, the museum offers fascinating relics from the areas past. 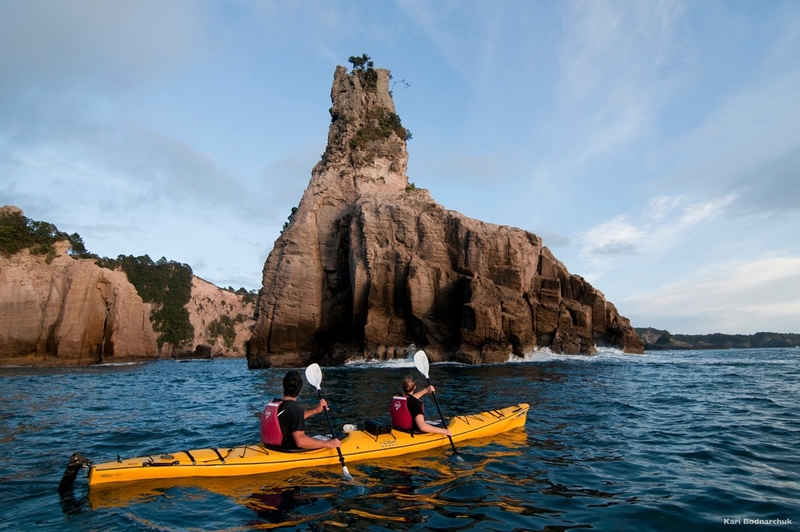 Swim in the many beaches and coves along the Coromandel coastline. View the fantastic marine life that is abundant in the Peninsula by diving or snorkeling. Go canyoning in some of New Zealand ’s most spectacular rain forests, jumping, abseiling or go sliding down a giant cascading set of waterfalls. Or just sit back, unwind, and relax in this wonderful coastal treasure of New Zealand. Colleith Lodge is purpose built accommodation, set on one and a half acres amid native bush and with sweeping panoramic views encopassing Tairua estuary in the Coromandel region of the North Island of New Zealand. Colleith Lodge was constructed with your relaxation, privacy and comfort in mind and is located in a unique area of the East Coast of the Coromandel Peninsula. Donna Thomas did an amazing job planning a trip for me and my family (me, my husband, and our two sons ages 15 and 20) to the South Island this past December. All her advice was perfect -- she crafted the most wonderful trip for us and at a price that I never could have gotten myself because she has such great contacts. For example, she arranged for us to stay at an apartment in Queenstown with the most fantastic views of the lake and the perfect location to all the stores and restaurants in town. This is one of her little "secret" places -- I didn't see it ever listed in any of the guidebooks, so I never would have found it on my own. And what is more -- the price was fantastic. Also, she did a terrific job mapping out our trip for the part we drove, detailed directions and maps of where to go and helpful suggestions of where to stop for gas or for a coffee, etc. I also really appreciated her high level of service. She actually called us shortly after we arrived in New Zealand and had checked into our first lodging to make sure we were fine and everything was to our liking. We couldn't have been happier with Donna. In fact, I tell all my friends, "don't even think of taking a trip to New Zealand without using Donna to plan it."